Summary: When twenty-something Wall Street analyst Kate Wilson attracts the notice of the legendary Julian Laurence at a business meeting, no one’s more surprised than she is. Julian’s relentless energy and his extraordinary intellect electrify her, but she’s baffled by his sudden interest. Why would this handsome British billionaire—Manhattan’s most eligible bachelor—pursue a pretty but bookish young banker who hasn’t had a boyfriend since college? A few weeks ago, I realized that I had never read OVERSEAS by Beatriz Williams. Don't get me wrong, there are plenty of books on my bookshelves that I haven't read or reviewed, but when I realized that Ms. Williams' next novel is being released this spring, I figured it was high time to read this one. I have to admit that the premise of OVERSEAS didn't appeal to me quite as much as her new book, but I thought it looked like a sweet read... and something a little different than my normal reading fare. OVERSEAS tells the story of Kate Wilson, an attractive Wall Street analyst who draws the attention of the very eligible bachelor Julian Laurence during a business meeting between their two firms. She is shocked that this gorgeous and very rich man would be interested in her, but she finds herself falling head over heels in love with him. As Kate becomes more involved in Julian's life, she begins to realize that he's not what he seems. She also starts to think that she and Julian have ties to the past -- and I'm talking the long ago past, like World War I past! As these two lovers try to protect each other from their history, they find that true love can exist despite the odds. There is no doubt that OVERSEAS is something I would normally pick up. I am not a big fan of romances (although I do enjoy the occasional chick lit/romantic comedy), and I usually don't appreciate time travel stories. As a result, I'm not sure I was the target audience for this book and I probably didn't enjoy it as much as some readers. Believe me, there are plenty of positive reviews out there and this novel has been published in many countries. Having said that, I found that I did like some things about OVERSEAS. First of all, I liked Kate and Julian and I thought they generated a lot of chemistry! When I started reading the novel, I became very interested in Kate and then Julian... and, of course, their romance. It was all very sweet and I liked the element of mystery surrounding Julian. I had a feeling where the book was going, but I just wasn't sure how it was going to get there. Another aspect of the story that I liked were the flashback chapters to Amiens in France during World War I. I thought the author did a wonderful job of bringing this time period to life and it was apparent that she did a great deal of research on World War I and England. I wasn't aware of this while reading the novel, but Ms. Williams actually based some of the characters on real-life people. I have to say that I thought the concept of OVERSEAS was pretty original and I did appreciate how the story combined the past and present. I thought it was a fresh approach to a love story and I enjoyed some of the messages about relationships including trust and sacrifice. However, I thought the book was way too long. OVERSEAS is over 450 pages and parts of the story (namely the middle half) just seemed to drag for me. I liked the beginning where Kate and Julian were getting to know each other and I thought the ending was pretty fast-faced and full of surprises, but I admit to getting bored in the middle. I think I would have enjoyed the story much more had the book been about one-third less in length. 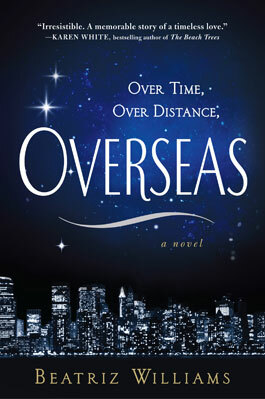 If you are looking for a romance for your next book club pick, then I think OVERSEAS might be a great selection. There is a reading guide available on the author's website, and it includes ten thought-provoking questions. Some of the themes you might want to explore include love, passion, war, sacrifice, destiny, cultural differences, and secrets. You also might want to talk about how the author juxtaposed war with the Wall Street financial crisis. Despite feeling that OVERSEAS was a too long, I did enjoy the novel. Recommended for fans of romance and historical fiction. Romance and historical fiction? Hm, this may not be for me. I used to say I didn't like time travel, but 11/22/63 blew me away. Come to think of it, there's romance and historical fiction in it too. I do like romance and a good time travel story (with the disclaimer that there are plenty of not so good stories out there) so this book was exactly up my alley! I loved it, and I can't wait to read her next book. She is also writing good straight historical romance novels as well. I read the first one and thought it was great! Guess I am a fan regardless of which genre or which author name! I love time travel books but I'm not huge on romance. I have this on my list too and just haven't gotten to it.